Following in the footsteps of my last review (Shellback Spiced Rum), here we have another spiced rum... Admiral Nelson's! Everyone knows the standard that everyone holds spiced rum to is typically Captain Morgan. And for good reason, Captain is reasonably priced, tastes decent, and mixes damn well with cola. That isn't to say there aren't better spiced rums (Kraken is awesome). But for now, we're looking at Admiral Nelson's Spiced Rum. This rum is an impressive 101 Proof, but for some reason has added "natural flavor and caramel color." Now technically many liquors can add a certain amount of caramel color without having to put it on the label. I don't know all the laws for rum, but it's on the label, regardless. 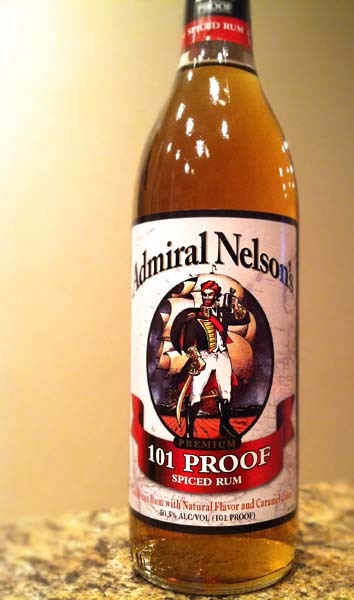 Admiral Nelson smells of vanilla extract, caramel, and harsh alcohol. Tasting brings exactly what I was expecting: in-your-face artificial vanilla, sweet caramel and butterscotch, subtle hints of clove and nutmeg, and a rough alcohol bite. This is definitely not a rum to be served neat or on ice. This is one for mixing. Actually, it mixes decently with cola or orange juice, masking much of the harshness. The spices are more subdued than in Captain Morgan or Kraken, and it's sweeter than something like Shellback. All in all, not the worst cheap spiced rum I've ever had, but not all that good either. Admiral Nelson is like Captain Morgan's drunk redneck cousin who is always wanting to take shots, start fights with strangers, and makes inappropriate sexual comments to other dude's wives. That pretty much sums it up. Rough and dirty, but out for a good time. Drink This: if you want a cheap spiced rum that isn't completely terrible and has a good, strong proof. Don't Drink This: if you want a rum you can drink neat or on the rocks. Kind of annoying the dude on the bottle has two arms and looks nothing like Nelson. Hard to tell from the resolution in your pic, but does he have a patch on his right eye? At least it's not the left eye. Have you had the Cherry version of this? I liked it. It mixed well with Mexican Coca-Cola and Throwback Pepsi. Alcoholic Cherry Coke/Pepsi. I would buy it again just for a cheap, go-to mixer when I don't want to waste the good stuff. The best this is my go to drink. If i could be a rep i would. Great with sweet tea, dr.pepper or coke.